Collecting snails in the field or bringing them into the laboratory often results in killing and preserving the animals. Gilbertson & Wyatt (2016) have evaluated several techniques for doing so. “The euthanasia of invertebrates used in scientific investigations poses unanswered questions regarding the rapid induction of unconsciousness with minimal distress and pain. Relative to vertebrates, invertebrates’ sensory experience of pain, nociception, and physiologic response to aversive stimuli are poorly characterized. The scientific communities in the European Union, Canada, United States, Australia, and New Zealand join in consensus regarding the need to address alleviation of pain and distress in cephalopods (octopus, squid, and so forth), which have the best-characterized nervous system among invertebrates. In the current study, we evaluated various euthanasia techniques in a terrestrial gastropod species, with priority on animal wellbeing, scientific variability, feasibility in both field and laboratory settings, and acceptability by personnel. In addition, we demonstrated that the 2-step method of euthanasia described in the AVMA Guidelines as acceptable for aquatic invertebrates is effective for terrestrial snails and meets all welfare and scientific requirements. This 2-step method first induces anesthesia by immersion in 5% ethanol (laboratory-grade ethanol or beer) followed by immersion in a euthanizing and tissue-preserving solution of 70% to 95% ethanol or 10% neutral buffered formalin. Furthermore, alternative methods of euthanasia for terrestrial snails commonly used in field research, such as live immersion in concentrated ethanol or formalin, were shown to be unacceptable”. Gilbertson, C.R. & Wyatt, J.D., 2016. Evaluation of euthanasia techniques for an invertebrate species, land snails (Succinea putris). – Journal of the American Association for Laboratory Animal Science, 55: 577-581. This entry was posted in Uncategorized and tagged fieldwork, varia on September 29, 2017 by bramb. Today I saw the paper published by Franke already in 2015. Because of its interests for this blog, it is summarised here. During a short visit to Barbados, the author found specimens of Pseudopineria barbadensis Kraus, 1996 and describes its habitat. From the same site a second species is reported, Truncatella barbadensis Pfeiffer, 1856. Franke, S., 2015. Fundortbestätigung: Pseudopineria barbadensis Kraus 1996 (Pulmonata: Urocoptidae) auf der Insel Barbados. – Mittheilungen Club Conchylia, 25: 19-22. This entry was posted in Uncategorized and tagged literature, Truncatellidae, urocoptidae, West Indies on September 28, 2017 by bramb. Today another tidbit, relevant for those of you who are scientists working for or affiliated to an institution. Please read the following an consider co-signing the paper in preparation by following the link below. Twenty five years ago, in 1992, the Union of Concerned Scientists and more than 1500 scientists published the famous declaration entitled “World Scientists’ Warning to Humanity”. They called on humanity to curb environmental destruction, warning “all humanity that a great change in our stewardship of the earth and the life on it is required, if vast human misery is to be avoided.” Now, on the 25th anniversary of their famous call, we looked back at their warning and evaluated the human response over the last quarter century. This 25-year update will soon be published by BioScience. This short article is only 1,000 words long and can be read in 6 minutes. If you are a scientist, we invite you to endorse this article by adding your name to the co-signatory list. In doing so, when the article is published by BioScience, you will be included in the full list of signatories in the article’s online supplemental material. We invite all types of scientists to sign (e.g. ecologists, economists, social scientists, medicine, etc.) including graduate students in the sciences. Please forward this email to any other scientists in your contact list that may also be interested in signing. For example, you could simply forward this email to your working group or Listserv. If you use Twitter, consider inviting your colleagues to add their signatures by including #ScientistsWarningToHumanity in a tweet. With your help, by forwarding this email to your scientist contacts, we will have many more scientists as co-signatories to present to world leaders. Thanks for helping get this important message to world leaders and to humanity. As of today, the article has been signed by more than 13,000 scientists from 180 countries. This entry was posted in Uncategorized on September 28, 2017 by bramb. In a hardly known journal, Zoological Bibliography, I found a paper by Dickinson (2017) providing more details on the data of Orbigny’s Voyage dans l’Amérique meriodionale’. 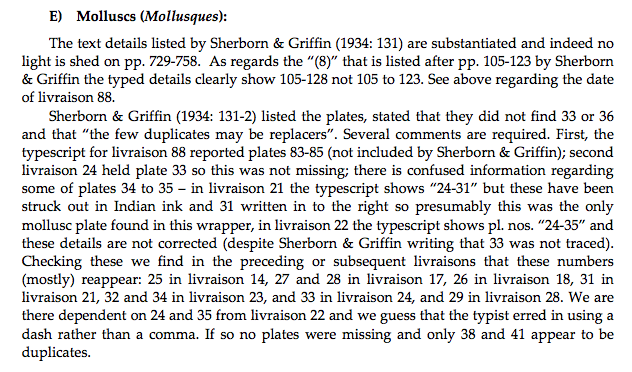 The paper relates to different parts of this series, but I copy here only the text on the molluscan part. 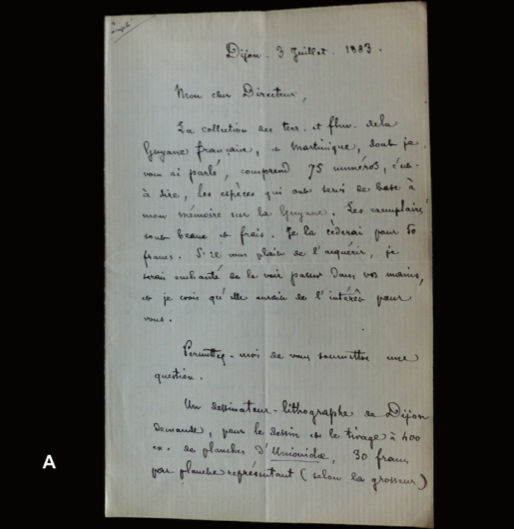 Interesting is also a second paper by the same author, dealing with the publication data of related work by d’Orbigny on birds, which sheds some light on the difficulty of dating the issues of the ‘Magasin de zoologie’. Dickinson, E.C., 2017. A study of d’Orbigny’s “Voyage dans l’Amérique Méridionale” I. The contents of the parts of the volumes on natural history. – Zoological Bibliography 5: 1-12. Dickinson, E.C., 2017. A study of d’Orbigny’s “Voyage dans l’Amérique Méridionale” II. On the composition of the 1837 and 1838 volumes of the ‘Magasin de Zoologie’. – Zoological Bibliography 5: 13-37. This entry was posted in Uncategorized and tagged bibliography, literature on September 27, 2017 by bramb. Today time for a tidbit about methodology and techniques. Already published some years ago, Galindo et al. (2014) provide a nice study about the use of microwaves to remove snails from their shells and the possible effect on DNA research of the animals. “Extracting DNA from gastropods presents particular difficulties due to the capacity of the living animal to retract into the shell, resulting in poor penetration of the ethanol into the tissues. Because the shell is essential to establish the link between sequences and traditional taxonomic identity, cracking the shell to facilitate fixation is not ideal. Several methods are currently in routine use to overcome this difficulty, including chemical relaxation, drilling the shell and boiling. Most of these methods are time-consuming, may be safety hazards and constitute a bottleneck in the preparation of large numbers of specimens in the field. We have experimented with a method traditionally used to clean shells that involves placing the living gastropods in a microwave (MW) oven; the electromagnetic radiation very quickly heats both the animal and the water trapped inside the shell, resulting in separation of the muscles that anchor the animal to the shell. Done properly, the body can be removed intact from the shell and the shell voucher is preserved undamaged. To test the method, the bodies of live-collected specimens from two gastropod species were separated from their shell by microwaving and by anesthetizing/drilling. After identical extraction and PCR procedures, the gels showed no difference in DNA quantity or quality, and the resulting sequences are identical within species. The method was then implemented on a large scale during expeditions, resulting in higher percentage of DNA extraction success. The MWs are also effective for quickly and easily removing other molluscs from their shells, that is, bivalves and scaphopods. Workflows implementing the MW technique show a three- to fivefold increase in productivity compared with other methods”. This is an interesting method for those wanting to prepare material for DNA research and who have the equipment available during field work. Note that the authors are usually part of full-fletched expeditions with much more facilities than the average field worker. One disadvantage, also mentioned in the paper, of the procedure is its unsuitability for ethanol-preserved material. That is a pity, since material from collections is usually difficult to remove from their shells. Galindo, L. et al., 2014. Using microwaves to prepare gastropods for DNA barcoding. – Molecular Ecology Resources, 14: 700-705. This entry was posted in Uncategorized and tagged dna, literature, varia on September 26, 2017 by bramb. Based on a small collection already made in 1982, Araya et al. have just published a paper on the snail fauna near Antofagasta. “New records for Bostryx holostoma (Pfeiffer, 1846), Pupoides minimus (Philippi, 1860), Stephacharopa calderaensis Miquel & Araya, 2013 and an unidentified charopid species are presented on the basis of specimens collected near the city of Antofagasta, in northern Chile. This is the first record for S. calderaensis after its description, extending its known distribution about 350 km northwards. Details on the protoconch of B. holostoma are presented for the first time, and this species extends its distributional range 145 km southwards. 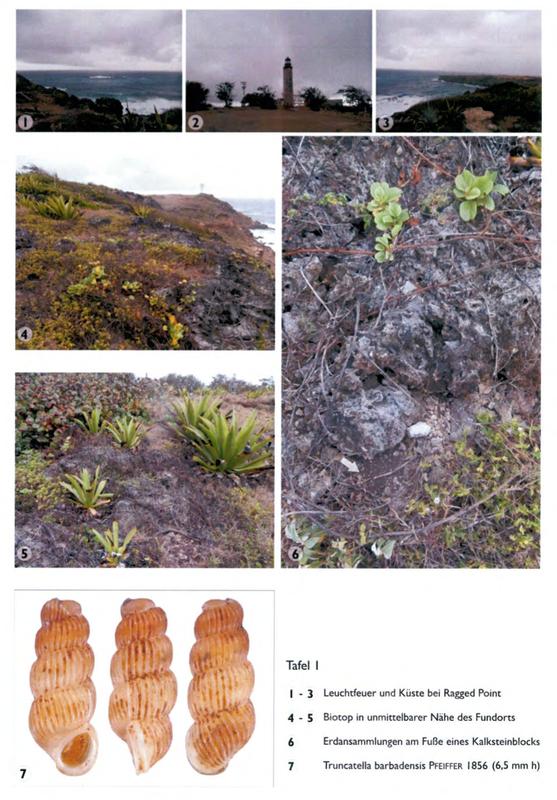 The microhabitat of these species in litho-refugia may explain the presence of these minute terrestrial mollusks in hyper arid northern Chile, further highlighting the need of additional studies of this neglected fauna”. 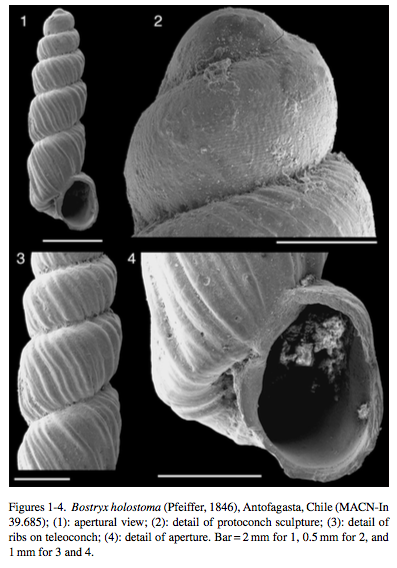 Especially the protoconch structure of Bostryx holostoma is interesting, as this reveals a spiral structure which is not present in other Chilean Bostryx species. As unpublished DNA results of species from this genus from different countries reveal, this genus may well be polyphyletic. Araya, J.F. et al., 2017. 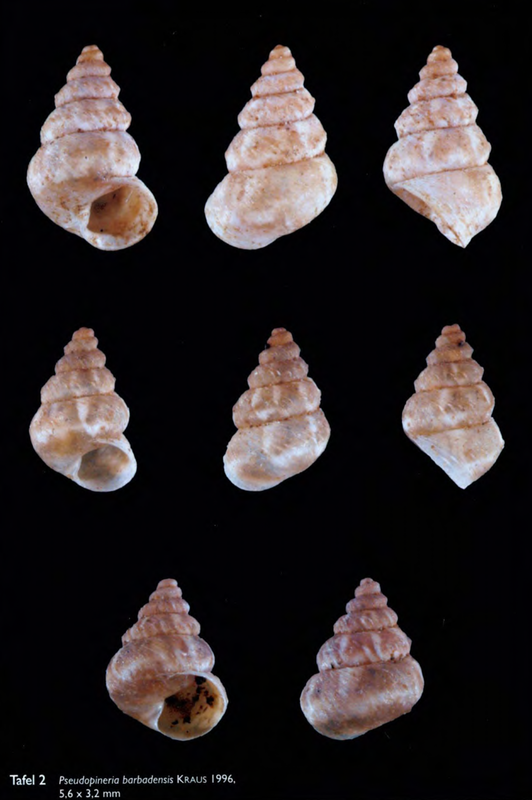 New records of terrestrial mollusks (Gastropoda: Stylommatophora) from Antofagasta, northern Chile. – Revista Mexicana de Biodiversidad, 88: 769-772. This entry was posted in Uncategorized and tagged bostryx, charopidae, chile, literature, Pupillidae on September 25, 2017 by bramb. Some of you may recognise this: frustration when you can nowhere find the type specimen you are looking for. This was my feeling when back in the 1970s I travelled all the way to Dijon in France to look for the type material of species described by Henri Drouët from French Guiana and Martinique. Sometimes you can solve it by selecting a neotype (but not if you haven’t crossed out all possibilities), or by letting the time work for you. This latter case is now described in a new paper where Backhuys and I report on the correspondence from Drouët to Crosse unveiling that these types were sold to Crosse in 1883. Having been integrated in Crosse’s personal collection, which was auctioned in 1899 after his death, this material has been dispersed to unknown collections and may be considered lost. Breure, A.S.H. & Backhuys, W., 2017. Type material of Drouët’s taxa described from French Guiana and Martinique. — Basteria 81: 24–26. This entry was posted in Uncategorized and tagged publications on September 15, 2017 by bramb.